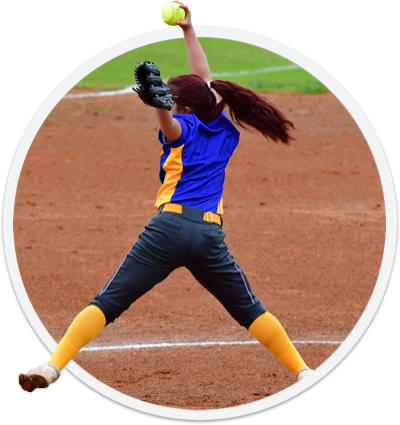 Get Started - "USA Softball"
Simplify the way your teams operate off the field and provide a better experience for your athletes and fans with SportsEngine’s online tools. Custom and secure online registration for sports clubs, leagues, and events — available on any device. Our 3-day online payment processing means faster access to funds so you can move your mission forward. Protect your organization and your members’ private data with secure payment processing that complies with PCI Level 1 guidelines. Access member and financial data in real-time with custom reports to get the information you need, when you need it. Detailed transaction reports let you monitor balances, deposits, refunds, anticipated cash flows, expired cards, failed payments, and more. 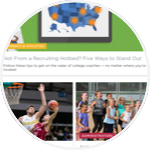 Signups react based on members’ responses, and make it impossible for parents and athletes to sign up for the wrong program. Members can sign up from any device, anywhere – without pinching, scrolling, and zooming. Remove cost barriers for families through multi-child/family discounts, flexible payment plans, and automated charges. Use athlete profiles created during registration to build team rosters and set up communications channels between coaches and families to chat, message, and share schedules. Filter your members, send messages, request payments, and view historical data from a single dashboard. Create static groups for easy communication with regular contacts or build a smart group that updates itself based on your search criteria. Build and manage a mobile-friendly sports website with easy-to-use inline editing technology, informational widgets, and dedicated team pages with unlimited storage. Your website will automatically adjust to fit the user’s device and provide the same great experience every time. Determine and set permissions of who can and can’t see certain information or pages to increase data security and the privacy of personal information. Create private pages, assign administrative access, and make sure messages are only sent to those who need to see them. Add, edit, and arrange content directly on the page without needing any coding or web development skills. Create a page element once, then mirror it on other pages throughout your website or affiliate websites. Every tool, widget, and page element your organization needs comes built-in with the platform. Give every team in your organization a space to share schedules, scores, stats, news, and video with their fans. Put every team event in one place and let members sync it to their Google Calendar or iCal. Organizations that want more options can work with our talented team of designers who will skillfully blend your organization’s brand with thoughtfully laid out messaging. Keep your teams in sync with our mobile app, team chat, RSVPs, schedule alerts, and scoring updates. Parents and athletes can RSVP from their mobile device to let coaches and teammates know if they can make it. Members and coaches can keep in contact through text, chat, and email, so everyone can stay up-to-date. Automatically notify parents and athletes when events on the team calendar are added, canceled, or changed. Use athlete profiles created during registration to build team rosters and create directories for messaging, RSVPs, and schedule alerts. Add family and friends from outside the organization to your contact list so every fan can stay up to date with the latest game results. Protect your athletes, their families, and your organization, both on and off the field. Ensure every coach and volunteer at your organization has the right character for the job. Protect the personal and financial information of your members with account-level permissions that prevent unauthorized users from accessing confidential data. Send, track, collect, and generate reports on bill requests made to members and teams. Create bills for anything not covered by the registration fee, and send them straight to your members’ inboxes. Parents can settle-up quickly and securely from their phones, and club administrators can keep track of who’s paid. Create smart groups to set up auto-statements and auto-reminders, coordinate mass billing, and view outstanding balances. Ensure proper financial oversight and transparency by managing access to a central record of all transactions and balances for your organization. Users receive automatic notifications whenever a bill is sent or a payment is made. Allow members to view all outstanding bills and completed payments from within SportsEngine. Parents can select to pay bills by credit card or directly from their bank account. Pull detailed reports on your organization’s members and finances across multiple registrations and seasons. Manage every aspect of your tournament — brackets, schedules, scores, and standings. Create and customize divisions with pool play, bracket, or custom game rounds. Quickly and accurately identify who moves on, then use the drag and drop editor to make changes before moving to the next round. Pre-formatted reports for venue schedules, brackets, or standings can be printed and posted in seconds. Use dozens of pre-loaded scoring and ranking criteria for every sport to record and share results. When severe weather strikes or conflicts arise, quickly update several (or all) game times and locations all at once. Then, notify participants of the change through text, chat, or email. See every time slot and venue in an interactive calendar to create a balanced schedule and avoid conflicts. Organize and manage your team or league, set up new seasons, keep records, share scores, display standings, and create a network of dedicated team pages. Set up new seasons, keep records of previous seasons, and separate regular season play from the postseason. Keep fans updated with real-time scoring and stats from every game around the league. Create customized displays that track stats and standings by pre-, post-, or regular season, then share them on sites across your league. Link all the websites within your league to create consistent network-wide navigation and the ability to share league content. Add, edit, and organize content on every page with built-in widgets for every sport. The online crowdfunding service you actually want to use — easily create a fundraising page, share your fundraiser directly from your organization’s website, and keep 100% of your funds even if you don’t hit your goal. Keep the money you’ve raised even if you don’t hit the full target. One simplified process built specifically to help athletes and sports organizations reach their goals. Cut out the hassles of traditional fundraising to make it easier for you and your supporters. Create an online store to let athletes, coaches, and fans purchase customized apparel from Under Armor®, Adidas®, and more. Full Access to entire Support Team, Sponsorship App, SportsEngine Listing, Squad Locker, and more. 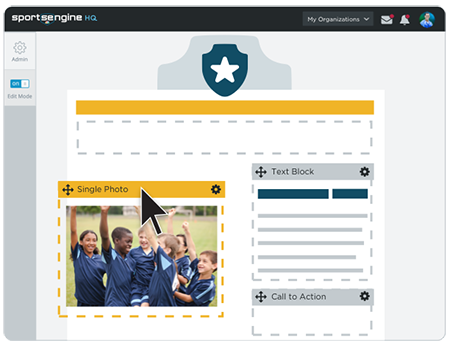 Claim your organization’s listing on SportsEngine.com and promote your programs to families in your area. Keep your athletes safe by monitoring injuries and treatments, and giving parents control over when they return to play. Remove the risk in your refund policy and allow members to purchase registration insurance that refunds their fees in the event of an injury or schedule conflict. Find and contact potential sponsors to build a sponsorship program that monetizes your website, emails, and registrations. Create posters and flyers for your next tournament that you can print out or share online. Organize your event volunteers and let them create, claim, and complete tasks from a mobile dashboard. Software, built with you in mind. USA Softball is partnering with SportsEngine, the leading provider of sport relationship management technology, to streamline and simplify the way your club registers athletes, builds teams, engages with members, raises funds, and manages your online presence. 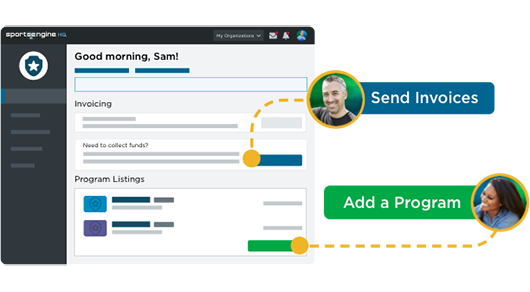 With SportsEngine HQ, you can search and filter member data, send messages, create bills, and run reports across multiple programs—all from a single location. Start today to take advantage of special pricing for USA Softball members. 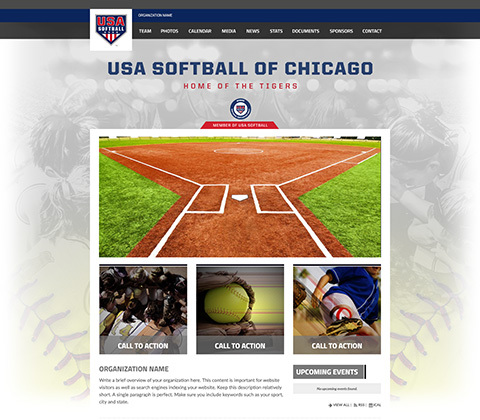 Show your team spirit with a customized website template for both USA Softball member organizations and local associations. 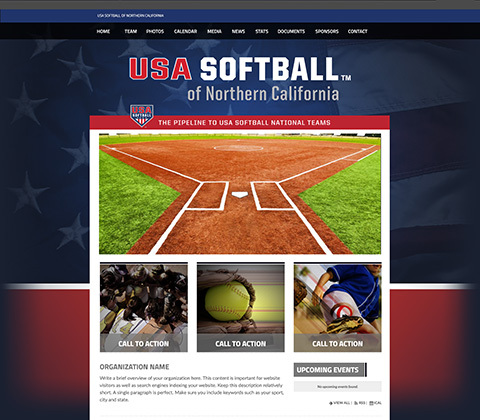 Website designs feature USA Softball imagery, your club’s colors, logos, social feeds, photography, schedules, scores, and fresh content that you can pull straight from USA Softball. SportsEngine is proud to be the Official Fundraising Partner of USA Softball, providing you with all the tools you need to raise money for any sports endeavor or cause. From fundraising websites and donation tracking to donor and database management, SportsEngine will help you raise the most money. 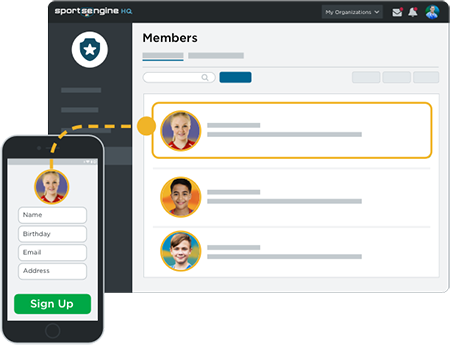 Member information from online registration forms flows directly into SportsEngine HQ—your club’s administrative space. Once an athlete profile is in SportsEngine HQ, your staff can work together to build rosters, create invoices, send bills, run cross-session reports, and even send messages to athletes that haven’t yet signed up for next season. SportsEngine HQ is the one place that all your volunteers and staff can go to run your organization as a team. 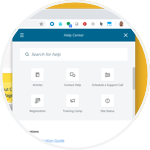 Empower them with integrated tools and services that work together to promote programs, organize events, create rosters, send bills, and share information. Get all the tools you need to organize, manage, and run a successful season from one place in SportsEngine HQ. Easily share online registration forms, promote programs, coordinate volunteers, create and post schedules and rosters, and share stats and standings on an easy-to-update website. 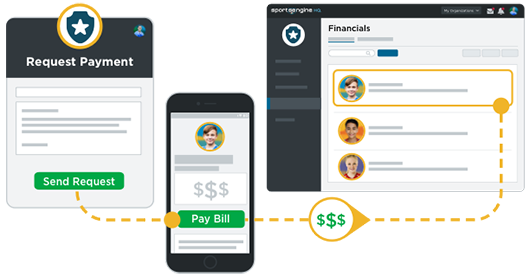 SportsEngine simplifies the entire registration and payment collection process by putting it all online. Forms are custom built to fit your exact needs and families can access our mobile-friendly registration forms from anywhere and quickly make a secure online payment. Create flexible payment plans and terms, apply discounts and coupons, automatically process payments and send out past due notices, send mass bills, and give families the to power to pay anytime, from any device. Change the way you raise funds and get the money you need to succeed on and off the field with assistance from our online crowdfunding platform, RallyMe. From new jerseys and equipment to travel expenses and tournament fees, if your club has a cause, RallyMe can help you find supporters. No one does sports websites better than we do. Our user-friendly drag and drop editor makes it simple for anyone to manage a custom, mobile-friendly website with all the information coaches, athletes, and families need—including schedules, scores, stats, social media feeds, photos, and contact information. 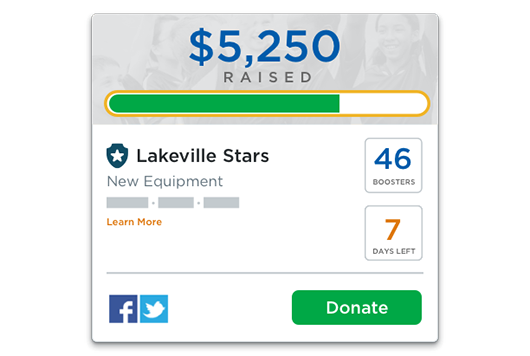 Create a better experience for your volunteers, coaches, parents, fans, and athletes with access to all of our online tools and support services. Signups Collect and organize athlete signups online. Websites Create and manage a mobile-friendly club website. Team Management Stay connected with team chat, messaging, RSVPs, schedules, and notifications. Safety Protect your athletes, their families, and your organization—both on and off the field-through industry-leading safety and security programs. Invoicing Send, track, collect, and generate reports on bill requests made to members and teams. League Management Create and manage schedules, stats, and standings for leagues of any size. When you win, we win. Whether your mission is to grow your organization or to provide the best possible experience for your athletes, we want to help you achieve your goals. That’s why you’ll always have access to our top-rated Customer Success Team and help resources. 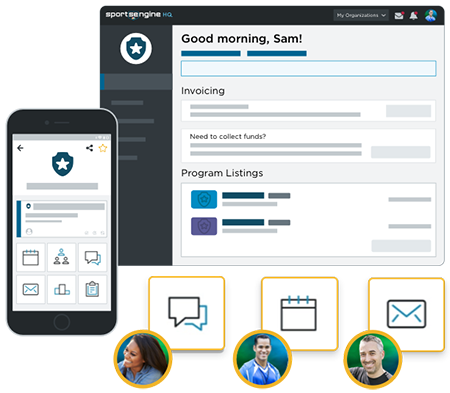 SportsEngine is the all-in-one platform you need to manage your organization. *Additional tools can be added at any time — costs and setup fees apply. Yes! Joining SportsEngine is free. We’ve made some of our most popular tools available to sports organizations for free in SportsEngine HQ to help further our mission of getting more kids involved in sports. By joining for free, you’ll receive access to tools that will help you raise money, secure sponsorships, find new members, collect fees, launch apparel stores, and market programs. Organizations can upgrade at any time to HQ Premium (starting at $69/month or $749/year) for online registration capabilities, member and volunteer management tools, invoicing, and other feature-rich sports management technology. To join SportsEngine for free, follow these three steps to get started. To start with SportsEngine HQ Premium, you can check out online to gain access to the full suite of SportsEngine tools. Within 24 hours, you will be contacted by your dedicated account expert with the next steps to get you up and running quickly. How do I get help if I have questions on any of my tools? We have many resources to help you get the most out of SportsEngine HQ. There is a help experience within SportsEngine HQ that presents contextual help information wherever you are on the platform. If you need additional help, you can chat online or schedule an appointment to talk with our customer success team. Plus, our Community forum is filled with other SportsEngine users that can help answer questions and share their own advice on how to get the most out of SportsEngine. If you have questions getting started, you can call SportsEngine at (888) 379-1035 to speak with a representative. There are a few fees you should be aware of. When using any tool that collects online monetary transactions, a processing fee applies. 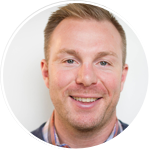 SportsEngine HQ Free: The processing rate for invoicing & billing tools is 3.5% and $2 on every transaction—these fees can be passed along to the individual making the payment. SportsEngine HQ Premium: The processing rate is 3.25% and $2 on every transaction for both the registration and invoicing & billing tools—these fees can be passed along to the individual making the payment. RallyMe: For our online crowdfunding app, the processing rate is competitive with other crowdfunding platforms at 7.9% and $0.30 on every transaction. In addition, for subscribers of the SportsEngine HQ Premium package, the rate you pay ($69/month or $749/year) is based on the expectation that you will use SportsEngine HQ as your system of record and process at least $1,000 worth of payments with SportsEngine during the 12 months of your subscription. If you do not meet the minimum processing requirement, you will be charged a $300 fee at the renewal of your annual contract. Can I add additional products and services later? Yes, you will always have the opportunity to add additional services after you join SportsEngine (including, background screenings, tournament management, website design, additional training, and additional content migration)—setup fees and other costs may apply. Can I cancel my SportsEngine HQ Premium account? You’ll have a full 90-days to explore all the ins and outs of your SportsEngine tools without any penalties for cancellation charges. After 90 days, your contract with SportsEngine is for one year from your original purchase date.